Guys. Guys. This is heaven in a garlicky, beany, herby, butternutty bowl. (Yes, I’m making up words- it’s that good!) 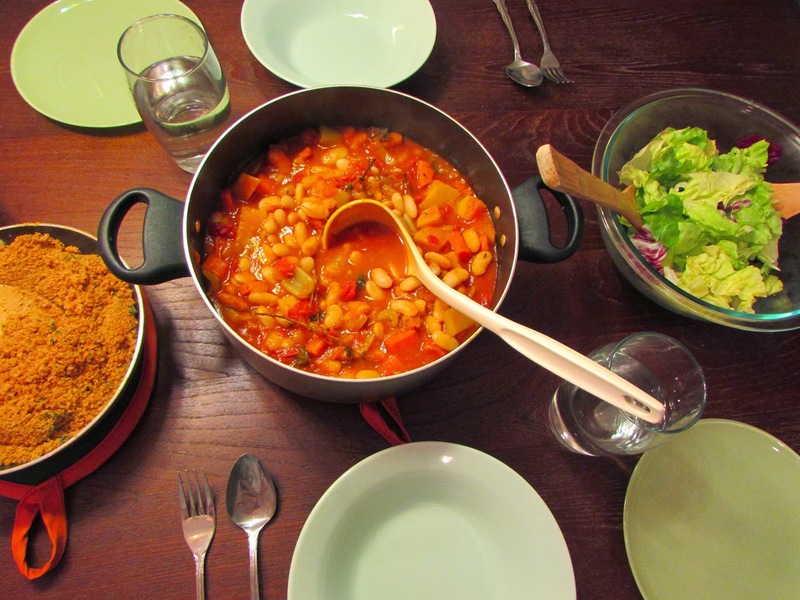 Remember I went on and on earlier about how I needed to vegetarianize some French dishes? Well, cross one of the list, folks: cassoulet! What in the lord’s name is cassoulet? Cassoulet is a French dish that originated in the south of France, typically brimming with various sausages, pork skin, and white beans. The cincher is that it is all cooked in a traditional, somewhat funnel-shaped, earthenware vessel called a “cassole“. I obviously do not have a cassole, nor do I eat meat, so you may be asking yourself what rubbish mockery I am posting here. Well, fear not! After intense cassoulet research, I realized that there are a.) a number of veggie versions, and b.) many of them have no need for oven cooking (a.k.a. no need for a cassole). Win. What you do need, however, is white beans. I purchased these beauties from Rancho Gordo. 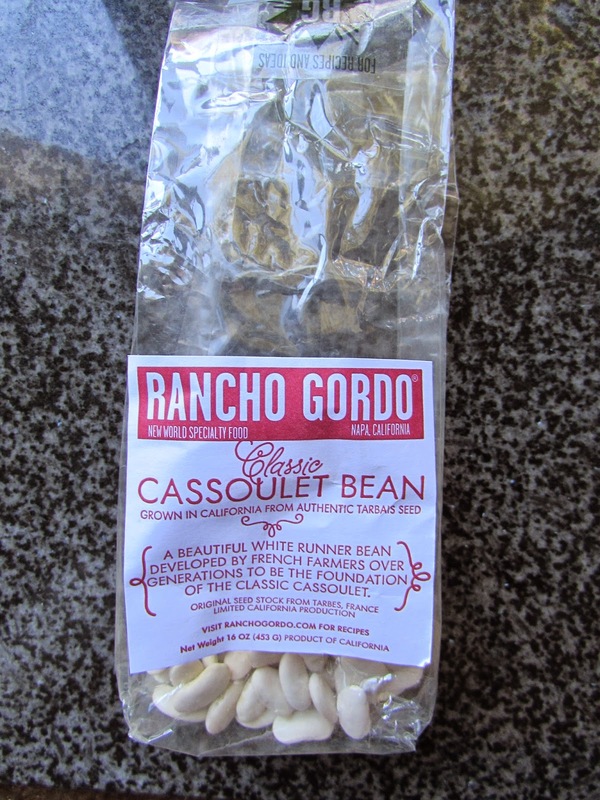 They are the classic cassoulet bean, grown from tarbais seed (see package above). Tarbais beans are IGP (Indication of Protected Geographical Origin), so Rancho can’t call them Tarbais because they are actually grown in California, but I digress. They are delicious, authentic, and hold up terribly well when simmered in a pot for hours. They may be my (*gasp*) favorite bean so far. Big words, coming from me. Yes, I am a bit bean-obsessed, my friends. Welcome to life as a vegetarian foodie. 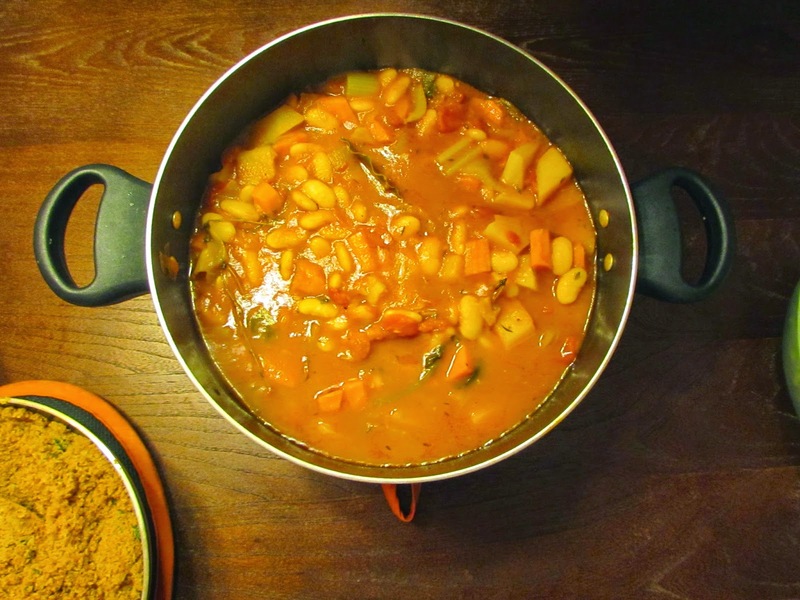 This vegan version of cassoulet is packed with white beans, tomatoes, butternut squash, provencal herbs, and garlic. The butternut squash gives this dish a seasonal touch, and lends it a distinct sweetness. 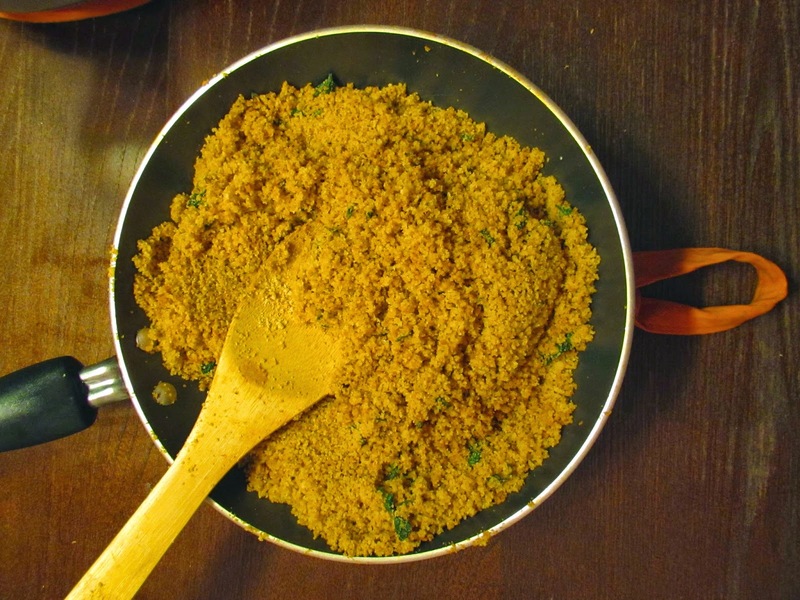 To top our bowls of cassoulet (I was eating with the boyfriend), I prepared garlicky bread crumbs. A salad of butter lettuce and raddichio with a simple vinaigrette made for a bright contrast of a side dish. Rinse and sort dried beans. 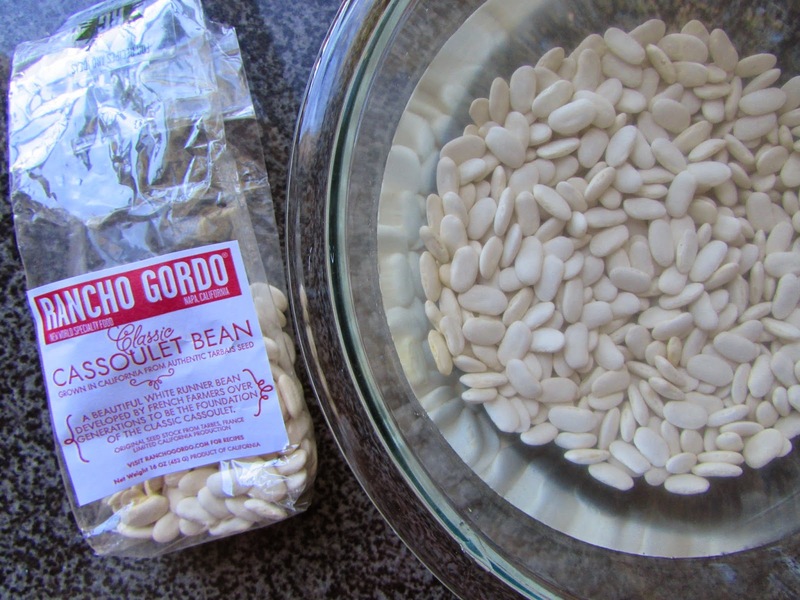 Soak beans in about 8 cups of water for at least 8 hours. Drain water. Heat olive oil in a large pot over medium heat. Add onion, leeks, garlic, carrots, celery, thyme, parsley, bay leaf, and optional cloves. Cook until softened, about 15 minutes. 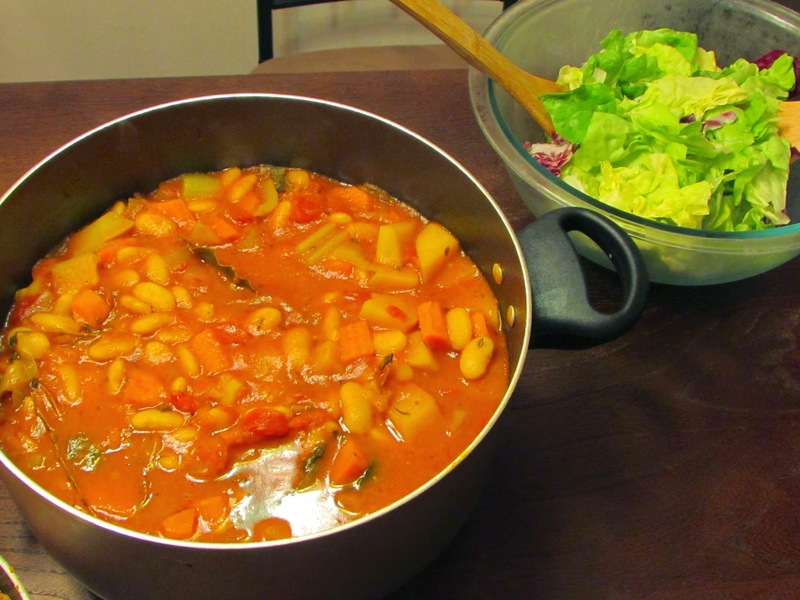 Stir in soaked beans, diced tomatoes, butternut squash, tomato paste, broth, and apple cider. Add salt and pepper. Bring to a simmer, and cook covered for 40 minutes, or until the squash is easily pierced by a fork and beans are tender. While the cassoulet is cooking, prepare the breadcrumbs, below. When the breadcrumbs and the cassoulet are both done, spoon out hearty bowls of the stew, and top with the garlicky breadcrumbs. Devour. Heat 1 tbsp olive oil in a large sautee pan on medium-high. Add breadcrumbs, parsley, and minced garlic. Once the oil is absorbed, add the remaining 4 tbsp olive oil and stir well. Keep stirring the mixture for 5-10 minutes, or until toasted to your liking. Add salt to taste. Note: I found whole wheat breadcrumbs at Whole Foods for a few bucks, and I highly recommend them! This is the perfect fall comfort bowl to dive into on a chilly night. Enjoy!